Diva, I’ve seen a lot of products that you can use to paint over existing formica countertops to make them look like granite, and I’ve also seen the granite overlays that cover up the countertop. Which one is better? I want to “re-do” my kitchen without spending a ton of money. Please, help! There are a few different paint processes out there that transform an existing formica countertop. They range in price from $50 up to $300 depending on the size of your kitchen and which company you opt for. A paint process is definitely the lowest cost way to redo your countertops. And many of them fool the causal observer into thinking you put real granite in your kitchen! That said, the paint process typically takes a couple of days from start to finish and then you need to wait a period of time for the product to cure fully before using your countertops like you normally would. 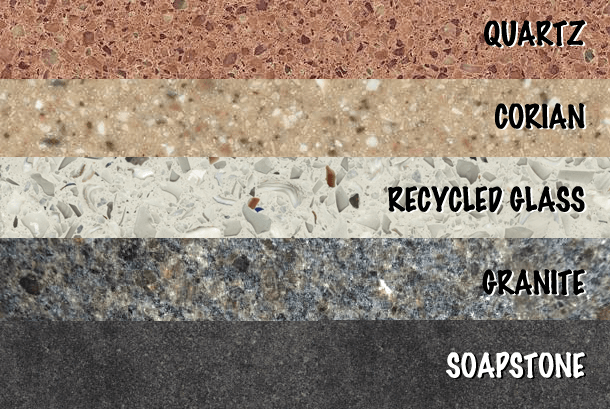 Just like with granite-looking paint processes available, there are several companies that offer granite overlay products. Unlike the paint processes however, granite overlay is actually made of real granite. It’s just thinner than what you get when you purchase granite slab! 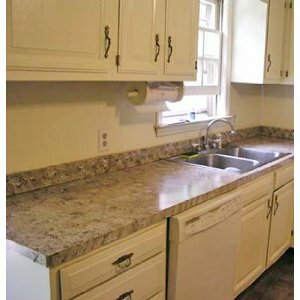 Most granite overlays are the same thickness you could expect from a granite tile, which is approx. 5/8″. You can either order a kit and do it yourself or have a company professionally do it for you. One thing to be aware of is that some granite overlay products are actually granite tile and you will indeed have visible seams. So if you’re looking for the seamless look of a granite countertop, make sure to check into seam placement before ordering. Depending on the size and project granite overlay products can start as low as $10 a square foot and range in price up to $30. This is just an average and you should be aware that it depends on where you live and shipping costs for the do it yourself kits. As with any other home improvement project, do your research before purchasing. Even though granite overlay products are not as thick as slab granite, it’s still more expensive than granite-looking paint. Still, it will generally take less time to complete. See, some companies boast that you can have completely different countertops in just one day using the granite paint method. Most mention it could take one to two days, though. Once the granite overlay is installed you won’t have a wait period, unlike granite-looking paint process. As you can see above, there really isn’t one type that is better than the other when it comes to granite over existing countertop. It all depends on how much money you want to spend and how long you want the process to take. Consider your budget and your level of know how before deciding on this or any other project!